Brand new portable wood panel bar in stock! This portable bar has been perfectly designed for 2 or 3 bartenders. This mobile bar rental is available to rent in Los Angeles, Orange County, San Diego, Santa Barbara & Palm Springs. Book ahead to guarantee availability! We are excited to announce our latest addition to our Los Angeles portable bar rental catalog. This white pristine bar rental is very sturdy & looks great in any location whether it be poolside, indoors or up in the Hollywood Hills. This portable bar rental is designed for 2 bartenders however it can fit up to 3. We currently have 3 in stock, book ahead to guarantee your reservation of this beautiful bar. How Much Alcohol Are You Serving? One of the exciting elements of being a bartender can be creation. Sure, the majority of the drinks you’ll serve to patrons will be old classics, but sometimes you’ll be asked or inspired to try serving something new. When this happens, you want to make sure that your new cocktail is balanced—you don’t want the mixer overwhelming the flavor or volume of the alcohol, but of course the opposite is even more true. Most importantly, you don’t want to serve drinks that have too high of an alcohol percentage—otherwise, your classy black tie event may descent into frat party territory quite quickly. So here is how to measure alcohol volume per drink. The drink’s total alcohol percentage is 12%. The proper range for an alcoholic beverage varies, but 12% is about the ABV of a glass of wine—not a bad barometer to consider when serving drinks professionally. So if you’re ever wondering if a cocktail you’re serving is too strong or too weak, try out this equation and shoot for around 12%. Champagne may seem easy enough to classify—is it bubbly? Then it’s champagne. But unless you’re simply using champagne to craft your mimosas, the sweetness of your champagne is a major factor in determining how much, and when, of the bubbly to serve. Here is a range of champagnes according to their sweetness (primarily measured through how much sugar is added to the beverage after fermentation). Brut Nature: Extremely dry with no added sweetness (this does not mean no sugar, just much less). Extra Brut: Some added sweetness to balance out champagne’s natural acidity. Brut: The most popular type of champagne. Extra sweetness ads body to the beverage, but the acidity is balanced out so that you can’t really taste it. Extra Dry: The added sweetness becomes more apparent at this level. The champagne takes on a fruity nature. Dry: Richer body and texture are benefits of dry champagne, although the fruity taste can be a turnoff for some consumers. Demi-Sec: The sweetness here makes demi-sec champagne an ideal dessert pairing, but this is the point where a sugar high would be a concern if a customer is drinking glass after glass. Doux: A rare dessert wine that goes well with creamy pastries, but would not be the right selection for a chocolate dessert. Blanc de Blancs: Made with 100% white grapes—primarily a chardonnay. Blanc de Noirs: Made with 100% black grapes—usually a pinot noir. Rosé: Made by blending blanc champagne with a red wine, usually a pinot noir. The ratio tends to be 90% white, 10% red. Know Your Ice Cubes: Using the ice from the fridge or that bag you bought at the grocery store may be convenient, but any distinguished bartender or drinker knows that it negatively impacts the presentation, consistency, and overall enjoyment of the beverage. While these may do the job for a casual pool party, for fancier occasions, you want that to use a single chunk, cube, or even sphere of ice. Trays that produce ice of this size can easily be found online. Use Fresh Mixers: Sure, buying a carton of orange or pineapple juice at the store is easier, but nothing beats the taste of fresh ingredients in your drinks, from fruit to even syrups. 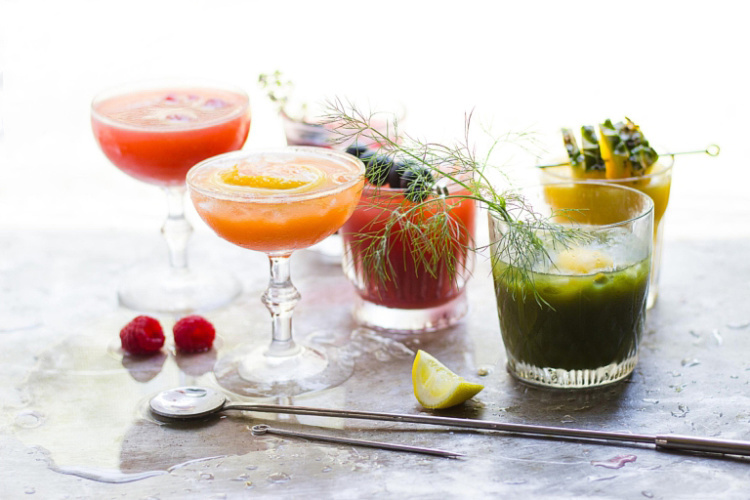 If you’re serious about your bartending, there are even specific juicers and siphons that allow you to make anything from a fruit cocktail to soda water. But if you are going to use store bought cola, at least use individualized cans rather than two liter bottles. This also applies to vermouth, which should only be used up to 30 days after being opened. Shaken or Stirred: While the majority of the people know how to order their martinis thanks to countless James Bond movies, know whether to shake or stir a drink based on its ingredients. Remember: shake cocktails if they are thick and contain flavorful mixers (such as juices), and stir those that include distilled liquors and light mixers (such as tonic water). Use a Strainer: While it is best to use ice to mix drinks, this ice will have already begun to melt by the time the mixing is complete. Once finished shaking or stirring, use a strainer to pour the mixed drink into a fresh glass along with fresh ice to ensure ideal taste and presentation. Limes: Limes can be used in a variety of ways, from just the peel, a wedge, a slice, or a wheel. Some limes are perched on the edge of a drink, while others are dunked right into the beverage. Limes are best used in sweeter drinks like margaritas, whiskey sours, or mojitos, or drinks mixed with cola or fruit juices. Limes can also be used to add a punch of flavor to more subtle drinks like vodka sodas or gin and tonics. Lemons: While lemons can often be substituted for limes and mixed with similar beverages, they are best used with darker drinks, especially those with whiskey, bourbon, or rum, and liquors mixed with colas. Of course, don’t forget the classic alcoholic lemonade if you want the lemon front and center! Oranges: While the juicy fruit of the orange can be added to any fruity drink for an extra shot of flavor, the rind and/or peel was made famous by the Old Fashioned. No Old Fashioned is complete without that peel to add a subtle yet necessary flavor to one of the world’s most popular and classy drinks. Cherries: Cherries are one one of the most popular garnishes, and it’s easy to see why—they add a burst to flavor to any drink and taste delicious with nearly any pairing. They often taste best in tropical drinks or bourbon or whiskey-based drinks—especially a whiskey sour or a Manhattan. Olives: Olives are almost exclusively used in martinis, and there is a reason for that—the two tastes compliment each other perfectly, but olives clash with nearly every other type of mixed drink out there. Use olives sparingly and specifically! Every customer that orders a drink from a bartender, whether at your local dive bar or a black tie soiree, understands that the man or woman serving them drinks is working a job—but why have bartenders so frequently been heralded as the ultimate listeners—someone who can provide a service while as well as a genuine connection? Because the best bartenders understand that their job isn’t to mechanically take orders and mix and distribute drinks—in addition, it is to set the mood and make the customer feel valued and welcome. Here are some tips to ensure that you leave your customers satisfied and grateful on top of satisfyingly buzzed. Connect to Your Customers: Yes, you may be the only man or woman behind the bar as a rush of customers are vying for your attention, but this is not an excuse to be short or perfunctory with customers. Even with a limited amount of time and a mounting load of stress, take a moment to make eye contact, smile, and politely ask what you can get them. While this may sound obvious, it is easy to forget or ignore during a busy shift. Establishing a rapport, no matter how brief, ensures that your customers understand that you are viewing them as human beings worth as respect, not just a potential tip in the jar. If something is wrong with their drink, apologize whether it was your fault or not, and do your best to make it up to them, whether this is through a free cocktail or more personalized attention. If the bar isn’t slammed, make sure that you’re making conversation with the customers—memorize their drink orders, try to remember their names, and ask how they’re enjoying the event. The more fun you have, the more fun they’ll have! Keep the Crowd Updated: Things will get hairy when you have dozens of customers vying for your attention or trying to shove dollars in your face. The simplest way of keeping them satisfied? Keep them updated. While busy with an order, select your next customer and tell them that you will be right with them—this will be a sign to the other customers that your next order has already been selected, and it should ensure that people are willing to be a bit more patient while waiting for you to finish measuring shots or finishing cutting a garnish. Clarify Your Orders: If your customer requests a drink that you’re uncertain or unfamiliar of, don’t assume they misspoke or pour them a drink with similar ingredients. There’s no shame in admitting you’re unfamiliar with a drink or uncertain if you heard them correctly—asking for clarification is far less embarrassing than failing to give the customer the cocktail that they really wanted. Organize Your Bar: Depending on the location and the style of the gathering you’re bartending for, it should be relatively easy to get an idea of what types of drink choices are most popular, especially as the event is a few hours deep. Organize your bar so that ingredients that are most often used and mixed together are stored close, thereby saving you from wasting time running from one end of the bar to the other. Keep the Bar Clean: No one enjoys leaning on a bar and coming back up sticky. Although you may be slammed by drink requests, keep an eye on the state of your bar, and keep a rag and a small bucket of distilled disinfectant handy—a quick soak and wipe of the bar takes seconds and keeps your customers happy. Make sure to dispense of empty glasses, abandoned straws, and used napkins as soon as you spot them. Tequila is one of the most popular liquor choices for any social event, whether serving pool party margaritas, classy black tie Paloma, or a happy hour shot plus lime and salt. 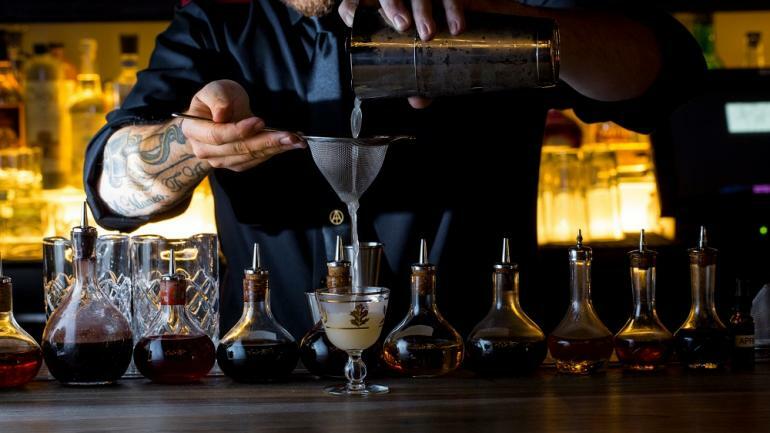 Here are some fun facts about one of the world’s most popular liquors that you can use to impress your guests--and even your bartender. Tequila and Mezcal are not one and the same: While the two are often used interchangeably in casual conversation, tequila and mezcal have several different requirements. Tequila can only be made from the Blue Agave, a plant found solely in and around Jalisco, Mexico, while Mezcal is less specific, able to be produced from several different types of agave. Therefore, while tequila is a type of mezcal, not all mezcal qualifies as tequila. Another common misconception is that tequila is often sold with a worm in its bottle—this is another attribute specific to other forms of mezcal. Blue Agave can take anywhere from eight to ten years to harvest—so next time you sip or shoot tequila, think about how much labor went into producing it. Drinking a limited amount of tequila can be beneficial for your health! Blue Agave contains fructans, a polymer that supplies probiotics that can assist digestion in the human intestines. However, don’t use this as an excuse to drink tequila every day—drinking too much of the liquor has the opposite effect. Jose Cuervo was the very first producer of tequila in the world. Jose Antonio de Cuervo y Valdes received land from the King of Spain in 1758 and used it to produce tequila. Three decades later, his son Jose María Guadalupe de Cuervo received the first charter to sell this tequila commercially. There are three main categories of tequila: Blanco (or silver), is the most popular and has the strongest taste of agave, as it is not stored before it is sold. Resposado (which means rest), is stored and matured in a cask for several months before distribution, when it picks up flavors that can be tasty but also distill the pure taste of the agave. Anejo tequila is stored for a significantly longer period of time (often over a year), picking up even more flavor. Shots of tequila may be popular in the U.S., but Mexican drinkers prefer to savor the liquor’s taste by sipping it. They also tend to save the salt and limes for margaritas, preferring to drink the tequila straight. Like wine, tequila is a popular choice for both smelling and tastings. Different types of tequila have a range of smells and flavors from vanilla, pepper, and apples. People are willing to pay top dollar for their tequila. The most expensive bottle of tequila ever sold went for $225,000 in 2006. Tequilas are required—by law—to be distilled at least twice before distribution. Although some tequilas are distilled more times, each distillation risks neutralizing the flavor. Premium tequila tends to hover around 40% alcohol by volume, or 80 proof, while lower quality tequila, which is diluted with more water, is closer to 55% alcohol by volume, or 110 proof. Some of the most popular tequila-based drinks are: Margaritas, Tequila Sunrises, Palomas, La Rositas, Jalisco Expresses, and Bloody Marias. We had great a 2017. Our services were featured on 5 reality TV shows. Our staff roster grew to 180 amazing & talented event staff. A huge thank you to all our wonderful clients, we are excited for more good times in 2018! We recommend booking ahead to lock in our most desired and talented staff! hypnagogic sensation that comes with seeing your fellow associates in a social scene. Anyone who has not witnessed or experienced this before, it can be a great episode to watch. Some thoughts that pop into your mind may be: "hold on, that mute person can actually speak — and has dance moves?" and, "I’ve never chatted with this associate ever, and now we are suddenly best buddies". These thoughts are quite the normal. Take a nice big breathe, we have created a list of the typical associates your likely to see at this year’s corporate holiday party so you can prep yourself. Which one will you be? When the Big Boss enters the room, he can separate the crowed like Zeus separates the ocean. You will notice pausing in conversations as those acknowledge the presence of the big boss. Out of instinct, fear and intimidation some employees will subconsciously hide their beverages and take it the celebration down a notch. The boss can be very intimidating for some, however keep in mind he is a human being too. Another classic term for this person is the Brown-Noser. For those of you confused on this term, google it. You can spot this person a mile away, talking to every person at the party as much as possible, almost unnaturally. Instead of treating the occasion as a fun festive relaxed event, they will be treating it as a networking affair attempting to maximize their position to climb the chain of command. This person will always bring up work and be watching everyone’s moves, be wary of these ones. You have never seen this person in your life. This person was brought to the party by a single co-worker. They will most likely look like a turtle hiding in the corner sipping a beer or six in their shell. Say hello to them, make them feel welcome and come out of their shell. The intern, most likely 18-22 has never experienced a corporate open bar before. They are very excited and don’t have much of an alcohol tolerance. Their voice will become loud, their life will turn into an open book with personal stories flowing out and begin dancing like they are in a nightclub . Their behavior will definitely become recognized, sometimes perhaps but not in the best way! These 2 associates think they are the slyest kids on the block. They both arrive to the office through different entrances or 5 minutes apart every day. They will avoid each other at the party, if you look closely you will see a few sly glances from each other. Hey you two, we know what’s going on! We see you! This person received this sweater as a Christmas gift from their grandma. It has been sitting in their closet for 10 years and has never found the right time to wear it. They are too busy with work to go shopping so they decide to rock the sweater. He or she embraces the sweater with Rudolf the reindeer on it and is unscathed by the stares. You've probably encountered the co-worker who talks endlessly about matters that are, frankly, TMI. He or she is way too open about their personal life, so you know absolutely everything about his or her romantic escapades, family, pets, landlord and hair stylist. Avoid getting cornered by this particular attendee or risk being forced into a conversation about what his or her cats will be wearing this Christmas, complete with a full-scale slideshow via smartphone. This party go-er is usually very professional, quiet and slightly nerdy. After a few bevies they eject out of their shell and start breaking out dance moves in front of the DJ or boombox. You will meet a completely new person that has come out from hiding behind their computer. They turn into the life of the party and it is fantastic! You know that one coworker who is really quiet and professional, perhaps even a bit nerdy? After they've had a couple cocktails, they're going to burst out of their shell with gusto. You'll see some intense dance moves, hear them spout hilarious jokes and meet a totally new person who’s been hiding behind a desk. They'll be the life of the party, and it'll be awesome. This co-worker is obsessed with Instagram, Facebook, Snapchat, and pretty much any shareable platform. They document all parts of the party so be aware of these party go-ers as you will most likely end up online! Acquire some ninja moves to dodge some embarrassing social media content. This party-goer is absolutely addicted to all things shareable. He or she documents every second, so when you get to the party, you will most likely end up on their Facebook, Instagram and Snapchat feeds almost instantaneously. Adopt ninja skills to avoid post-party digital embarrassment. This co-worker is in the midst of planning a much needed long holiday or is in the process of switching to another company. He or she can be very entertaining with their YOLO attitude towards the party and during the office’s day to day work. This person can be a hoot to watch and once alcohol has been added to the equation the show gets better & better! This colleague is currently in the middle of planning a long vacation or is heading to another company ASAP. This person can be highly entertaining, though. His or her "DGAF" approach to the party — and to daily office life, for that matter — can be ridiculously amusing to watch. Add alcohol to the situation and it can become even more of a spectacle. Forget boring corporate holiday parties. Make this year’s an unforgettable one with Platinum Bartenders. We have fun outgoing staff and open bar packages that make planning your bar a whole lot easier. I love writing and talking about tequila. 1. Don Julio 1942 (Anejo) - This is one of the best tequilas produced. Aged in oak barrels for over one year, the tequila has a natural golden brown color and an exceptionally smooth taste. 2. Clase Azul (Reposado) - 100% Blue Agave. Complex aromas of cream soda, spice, caramel and earthy agave. A long sweet finish. 3. Jose Cuervo De la Familiar - This tequila is beyond smooth, maybe because its aged 3 time longer than any regular Anjeo Tequilas! 4. Casa Noble Anejo 2 yr - This exquisite tequila is matured in French White Oak barrels and extra aged to perfection and produced in limitied production. 5. Maestro Dobel Dimaond Tequila (Blend) - Made from a blend of Reposado, Anejo and extra Anejo Tequila's. This is then married in new Balkan oak barrels for 60 to 120 days. Simply smooth the best! 6. Corzo Silver Tequila (Blanco) - A fresh seductive fragrance that includes scents of cucumber, agave pulp, fennel, pine, coriander, and mint. The palate entry is smooth and with agave notes. 7. Casamigos (Blanco) - 100% Blue Weber Agave which is grown in the rich, red clay and cool climate of Jalisco Highlands of Mexico. Formally owned by George Clooney, sold for 1 billion. 8. Roca Patrón Silver Tequila - Distilled twice & finished at 90 proof to create a crisp, robust tequila with notes of sweet agave. Are you sick of the same type of events? Bartenders, servers, hors d'oeuvre and small talk conversation are the typical Los Angeles party standards, and the views of the Hollywood Hills or on the Pacific coastline are stunning...however we have noticed one thing missing.... GAMES! 95% of the people in this world love to play games, so why have we left them behind to our college days? Most people plan for event bartenders, chefs, valet, food, drinks and then forget the core ingredient, FUN & ENTERTAINMENT! Every party I've managed that brought in some form of game(s) has been a huge hit! Everyone becomes more interactive with each other and the event becomes more memorable. Platinum Bartender events that feature fun and games tend to be the most requested and best reviewed events that the company puts on. Feel free to email us with the details on your next event and we can help come up with some fun games and entertainment to make your party a memorable one for the books! Also, one of favorite vendors has a HUGE selection of fun and creative games including: Dunk Tanks, Giant Inflatable Darts, Foam Party Pits, Big Shot Photo Booths and much more! visit: http://www.partyworksinteractive.com to see more! A successful event depends on the type of staff working and how well they interact and engage with your guests. Not only is the event staff the face of your event, they help create the party's vibe. In most cases, staff is overlooked, which can unfortunately harm your event. Throwing events can be expensive. but cutting costs for quality staff costs you more in the long run if the result is an unsuccessful event. Book in advance. Once you find a company that fits your needs and has positive customer reviews, contact the company right away to check their top staff’s availability. A crucial mistake anyone planning an event can make is waiting too long to make a choice. While there are a lot of options out there, shopping around for too long can result in the company's best staff being unavailable. To avoid this, book as far in advance as possible. Every event is different and every event staffing agency is different. The staff is the front line and face of your event. Often events become so large that some guests may not even be able to find the host. Having suitable event staff to help run the event while you're busy can have a huge impact on the image your guests perceives of the event. When hiring multiple vendors such as bartenders, DJs & chefs from different companies, it’s important to introduce and consult all team members. Make sure to establish ground rules and sharing rules of the event space so all members can efficiently work together as a team and create a positive environment. Before speaking to any event companies, it’s important to know how many guests will attend, event duration, theme, type of audience that will be attending, amount of staff you will need, and the type of foods/beverages you would like to serve. Obtaining this information before contacting your vendors will save you going back and forth. Any event staffing agency can build a website and promise top quality service. However, there are a lot of unprofessional event staffing companies out there. Always check their Yelp/Google reviews and read the customers reviews. Next step is to speak over the phone directly to the person in charge of staff selection & allocation. Explain to them what you’re looking for, make sure they are confident that they can provide you exactly what you’re looking for. Never settle for anything less: It’s your event, it should be special, so if you feel their staff won’t add value to your event, find a company that will--they exist! Bar catering or portable bar service is one of the most convenient ways to hire a bartender for your party. Whether your party is in Los Angeles or the Hollywood Hills, getting all the necessary ingredients to have a full cocktail bar can take a lot of time away from you planning your event. Make sure the company has a mobile bar for rent along with open bar package options available so your bar can really stand out at the event! 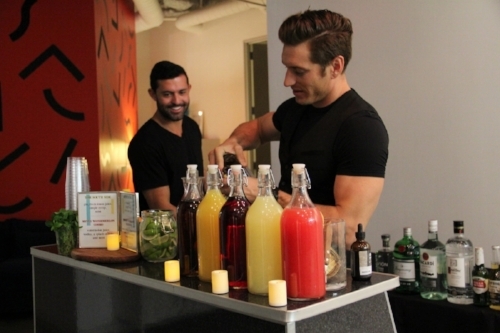 If you're looking to hire a mixologist, make sure the staffing agency has a craft cocktail bar catering option available. Educating your event staff on what the event is, the purpose, and schedule will allow them to effectively respond to your guest’s questions or concerns whenever needed. All events should have some form of budget in place. If you are stuck on deciding between two staffing agencies and the better company is slightly over your budget, take a moment to think about the qualities of the two vetted staffing professionals. Most of the time the higher priced company is more expensive due to high demand and better-quality staff. If both companies are very similar and you are hiring more than 5 staff, contact your first choice to see if they could offer you a better price. Clearly defining each staff’s job description before the event will allow them to perform all their responsibilities the way you want. The more direction you give the staff at the beginning, the less you will have to micro manage, resulting in you spending more time enjoying your guests' company. Whether you’re looking to hire a bartender for a private party or hire a wedding bartender, appearance, personality & talent are the 3 key factors you should take into consideration when selecting your staff to create the atmosphere you envision. Once you select and hire the event staff, make sure you instruct the staffing agency on how you’d like the staff to dress to match the atmosphere. Today we’d like to introduce you to Jesse Owens. I started working at the Ritz Carlton / JW Marriott in Downtown LA as a bartender all over the hotel including WP24, the pool bar, the lobby bar, but mostly working events mostly in their 100,000 square feet of event space for 3 years. On the side, I worked for about 10 different catering and event staff companies similar to Platinum Bartenders. While working for all of these companies I took notes of the good and bad things these companies did and that’s how Platinum Bartenders LLC was born. The market for a good quality bartender is huge in LA. This last November/December was the busiest months we’ve had. The struggle was all of our staff being booked on events and not having enough left to fill new event bookings. Our team really came together during these months and through referrals we ended up hiring new staff that fit our criteria to fill all the events and which also expanded our current staff roster by almost double! So let’s switch gears a bit and go into the Platinum Bartenders LLC story. Tell us more about the business. Platinum Bartenders provides attractive, personable and talented event staff in Los Angeles and surrounding areas. We are a full service event company that can execute open bar service, bar rentals, DJ’s, Go-go dancers, serving staff and much more. We have hosted everything from small gatherings, VIP celebrity events, music festivals and corporate events with thousands of guests. Being a Platinum Bartender staff is not for the unskilled or mediocre. You need to not only mix a fine drink but also engage and create entertaining conversations, handle crowd control, ensure the guests are having a safe fun time and of course, look the part. We provide more than regular event staff – we provide PLATINUM staff – and pride ourselves in quality staff over quantity. Providing staff that guests feel excited to talk too is really what sets us apart. We don’t hire a just a pretty face, our staff make the party more exciting with their outgoing and fun personalities. We also provide shirtless staff & bikini bartenders for bachelor / bachelorette & LGBT parties seeking a shirtless bartender. 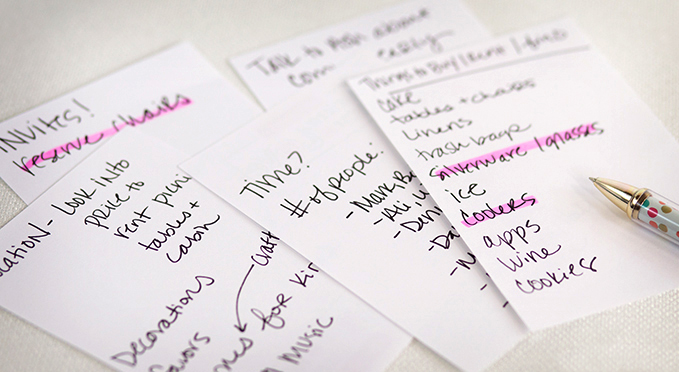 The easiest method to keep track of all tasks & steps needed to have a successful event is to make lists. Dividing your list into smaller lists allows you to focus and execute each list effectively. Below is 10 lists to help you create your perfect event. Pick a theme that suits the time of year & guest list You may be planning a costume party, backyard BBQ, a formal black tie party, a pool party or a charity event. Once you have picked your theme create a list that includes all the details that support your theme for i.e: props, outfits, unique food, special talent, decorations and props you will need to purchase or rent. For larger events you will need to further break this list down into more details as lists below. Write down the budget your willing to spend on your event. Begin by writing down the cost next to each item you will need to purchase in your theme list. Total all costs together & look for items or areas you can cut costs without neglecting your party theme. This list is confirmation of all attendee's that are confirmed for your event. It is a great way to keep track of who is coming & will assist you in planning your food & beverage catering. Include all of your decorations that you will need to create the perfect theme & environment for your event. I.e candles, streamers, table cloths, wall art, party favors? Do some research online of similar events, be creative when listing all of the decorations you would like to have at your event. 6. Food and drink list. List what food & beverage items you already have available and then list what items you will need to purchase or have catered. Depending on your budget having your food & beverage catered to your needs takes a lot of stress of you in the planning process and on the day of your event. If you would like to have your event catered create a list of food items that you think will match your theme. If you have trouble thinking of what you should include in this list, do some research online or call a bartending or food catering company for assistance. List all supplies & rentals you will need to pick up or have delivered. This list can include non f&B items such as forks, knives, plates, napkins, bowls, tape, cords, speakers, umbrellas, chairs, tables, trash bags. If your planning to bring in your own DJ or play DJ yourself its always a great idea to create a playlist ahead of time and have it ready for the day. This list is for the day of your event and will help you execute everything you need to do efficiently. Perhaps you will need to run down the street to pick up some catered food, last minute supplies, put up decorations, set up the party area or electrical supplies for event performers? The final list is your clean up list. This helps you remember what rentals & items need to be returned, trash that needs to be removed, pay outstanding balances associated with your event and everything that needs to be addressed to before you can relax! Making a drink is similar to making a perfume. When you smell a scent, it has to have several layers. Once the alcohol evaporates, what are you left with? Most perfumes started with a solid base note. So start tasting different spirits and try to figure out which one you want to start with as your base mix for the drink. Once you decide keep in mind that you’re the choice of your base spirits flavor will always remain in the cocktail. Once you have decided on your base liquor (also note that you can always have two alcohols in your base) the sweet and tart elements become your canvas for creativity. A tart element could be something like freshly squeezed lime or grapefruit juice and a sweet element could include simple syrup, agave, a (lower ABV/alcohol by volume) liqueur and plenty of less concentrated sweet options such as orange juice. With this framework in mind, the mix-and-match possibilities are endless. The difference between decent drinks and amazing drinks is often the length of their flavor, how long it sits in your mouth, fascinating your mind once it leaves your tongue. By making the sweet and tart parts complementary to your base flavor, you will expand on the cocktails experience. This is why many top mixologists enjoy using dark brown spirits as their base-flavor for their creations. Whiskeys tend to have more complementary flavors than tequila or vodka. Once you have completed your 2:1:1 cocktail, the next step is adding aromatics. The simplest way to do this is to include a couple of drops of bitters—a minuscule amount of liquid that won’t mess with the balance of your ratio. Technically, in the history of the classic cocktail world, a cocktail is not considered a true cocktail unless it contained bitters. The true original formula of a cocktail was to simply just add alcohol, bitters and sugar. If you didn’tadd bitters you could definitely taste something missing. They added this final kind of balance that brought everything together—like the glue. However bitters are not your only solution. You can add complex glue quickly is through a wash on the inside of the glass with something like absinthe. Or you could also use a hydrosol, which is a distillate of herbs or flowers extracted into water or oil. Rosewater is an example of a hydrosol. my cocktails consist of only five ingredients. Beyond that, the flavors can become muddled. Your cocktail at this point should taste pretty amazing. But what if it’s just too boozy? or not completely satisfying? Soda water or even some champagne with some citric acid or a little extra simple syrup usually help to complete the balance. I tend to add soda water to 80% of my cocktails to give it that bubbly and refreshing edge that is missing. Remember to keep in mind that eyeballing for speed is never a great option for your measurements once you have them figured out. Cocktail making is similar to baking, you need to make sure all of your ingredients are correct to achieve perfection.